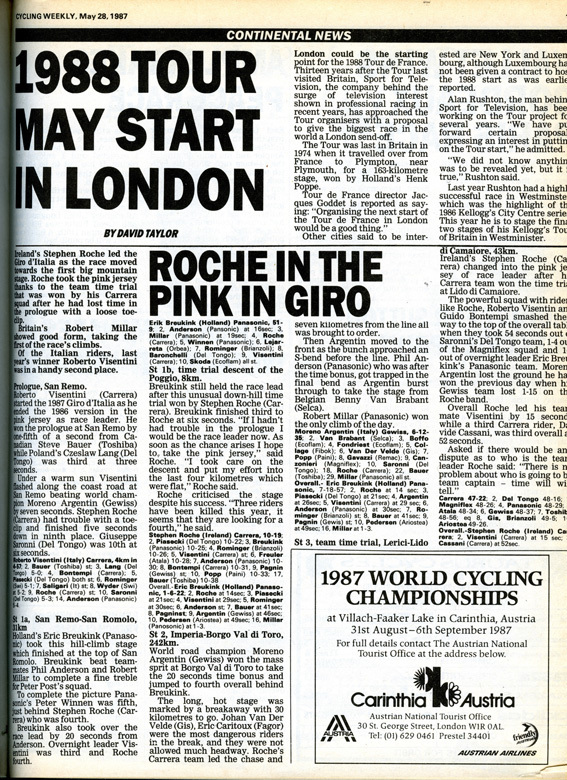 We continue our look back through the Cycling Weekly archives to see how the magazine covered the 1987 Giro d’Italia ? one of the most controversial of all time. Ireland?s Stephen Roche still led the Giro d?Italia after the first two big mountain stages failed to dislodge him from the pink jersey. Despite some friction in the Carrera team between Roche and Roberto Visentini, who trails Roche by 32 seconds, the Irish star was equal to every move, even attacking on the climbs. Britain?s Robert Millar, seventh overall, showed a clean pair of heels to the field on the bigger climbs and was leading the mountain classification. Roche faces two tough tests this week. On Thursday, there is a 45-kilometre individual time trial and on Sunday the Giro has its hardest stage, at Canazei, with four major climbs. On his present form Roche is set to become the first Irishman to win one of the big three tours. World champion Moreno Argentin scored his second win in three days at the hill top town of Montalcino. Another Italian, Flavio Giupponi, was second and race leader Stephen Roche third. Argentin sat on the wheel of team-mate Emanuele Bombini for much of the seven-kilometre climb, attacking in the final kilometre to collect the 20-second winner?s bonus. Roche, who lost three seconds to Argentin on the run-in to the finish, received 10 seconds bonus to extend his overall lead to 32 seconds over Carrera team-mate Roberto Visentini. Belgian Eddy Planckaert won the mass sprint at Terni to take the stage and his first words were to thank his Panasonic team-mate Phil Anderson. ?Phil led out the sprint for me. He got me in the right place and led like a rocket. All I had to do was finish his work,? Planckaert said. It was the first real sprint of the Giro with a wide open road and all the sprinters going for it. Paolo Rosala led out the final sprint, but 200 metres from the line Planckaert passed him with ease. Stephen Roche was still in the pink after this, the first mountain stage, although it was Frenchman Jean Claude Bagot who was first over the line. Bagot beat Roche?s team-mate Eddy Schepers after they had broken away from a 13-strong group on the climb of the Terminillo. Roche attacked twice on the 17-kilometre climb and finished in the group that contained Roberto Visentini, Eric Breukink, Toni Rominger, Marino Lejarreta. Robert Millar, Peter Winnen, Flavio Giupponi, Pedro Munoz, Joakim Mugika and Roberto Pagnin. Roche went 30 seconds clear at one time before being caught by Millar, Lejarreta and Visentini. Then there was a regrouping when a Pagnin-led bunch tagged on to Roche?s group. Missing were Phil Anderson, who was to lose two minutes, Giuseppi Saronni, who lost over three minutes and world champion Moreno Argentin who was at 4-33. Roche had some hard words for his Carrera team mate Visentini after the stage. ?When Visentini caught me with Millar and Lejaretta he would not work to open up the gap on Anderson and Argentin, as I told him. It was an excellent chance to distance them, but for all that the day was not bad for me,? Roche said. Argentin was not too worried. ?I finished well and that gave me confidence for the next stages. I still have a role to play in the Giro, despite all the time I lost. Roche and Visentini are at war with each other. Riders like Millar, Breukink and me can profit,? the world champion said. Moreno Argentin won his third stage of the race at the winter sports centre at Roccaraso. The uphill finish suited Argentin and he left his rivals for dead with his final burst with Franco Chioccioli second and Johan Van Der Velde third. Stephen Roche finished in the main pack to retain the race lead. For the first time in this year?s race the riders rode under a heavy downpour and it was not until the climb at Piano Delle Cinque Miglia, with 15 kilometres to go, that the stars swung into action. Robert Millar took the climb to add to his points as the best climber. Roche followed him over the line at a respectable distance, but Millar did not pursue his effort. Then Steve Bauer attacked with Juan Fernandez at the three-kilometre board only to be caught in the last kilometre. Chioccioli made a big effort at the 400-metre mark but on the one in ten finish he was unable to match Argentin?s explosive burst. ?I watched the attacks on the last climb as I did not want a break to develop,? Roche said. ?As for the finish there is no-one who can beat Argentin in this kind of sprint.? Millar said he is only interested in the climber?s jersey in the Giro. ?If I can win a stage as well, so much the better,? he said. ?I knew today?s last kilometres would not suit me. On the run in I had no chance. Sprint specialist Paolo Rosolo (Gewiss) took two lengths out of Guido Bontempi (Carrera) and Stefano Allochio (Brianzoli) to win the stage while Roche had an untroubled day defending his race lead. Heavy rain did not stop the race from being very fast, the 168 kilometres being covered at over 45 kilometres an hour. In the last kilometre the bunch caught four riders who had broken away with 30 kilometres to go, Philippe Chevallier, Roberto Pagnin, Rodolfo Massi and John Talen. Pagnin was the last to give in, being taken 500 metres before the line by Adriano Baffi, one of the fastest of Italy?s new generation of roadman sprinters. He in turn was passed by Rosola with 150 metres to go. The win bought Rosola?s tally of Giro d?Italia stages to eight over the last few years. The Atala team worked itself into the ground over the final kilometres of the Giro?s longest stage to successfully lead out their top sprinter, Urs Freuler. Freuler was in top form to prevent Paolo Rosola scoring a double after his win the previous day. The Italian had to settle for second spot as Freuler scored the 12th giro stage win of his career. Once again the day was marked by continuous rain, and although numerous breaks formed none were allowed to gain any headway as Roche?s team and the Panasonic squad kept a tight rein on the bunch. The Tour to start in London in 1988? Never let it be said CW hasn’t got its finger on the pulse! The magazine was 20 years early with this news!